Zahra Elliot and Melanie Boiling twirl during the playing of the National Anthem. Friday night lights blaring. The crowd cheers during halftime, amazed by the daring performance right before their eyes. Twirlers spinning fire, moving to the rhythm of the marching band beat. Ten years and hard practice prepared them to perform. Their hard work proves to be paying off, being that they had special permission to join the high school marching band as middle schoolers with personal coaches. 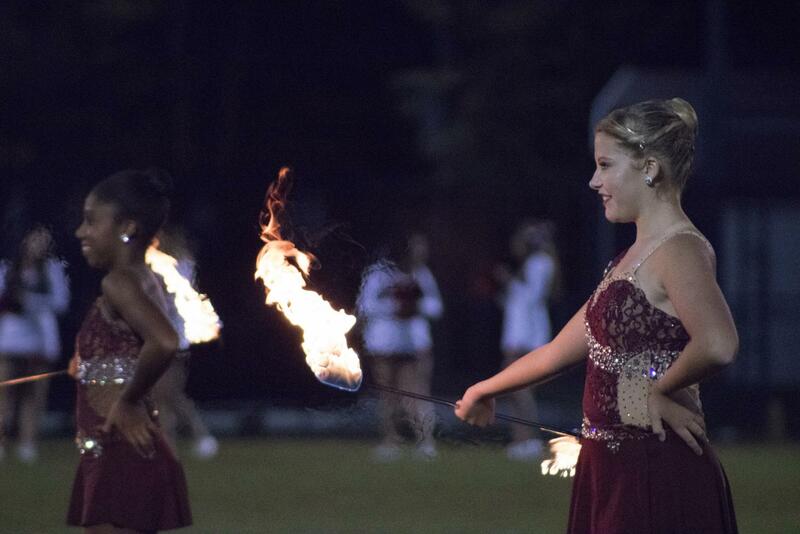 Freshman Zahara Elliott describes what it’s like to be a twirler. “It’s challenging, but I get a lot of compliments and credit. Melanie and I have been twirling together since we were four. I think it’s easier to twirl by myself because I can fix my own mistakes. When you twirl with a partner you have to be in sync and work together. My goal for the future would be to get a scholarship, because it’s hard to get a scholarship for twirling,” Elliott said. Zarah is one of only two twirlers at Brookville. She and her partner, freshman Melanie Bowling, share their passion for the demanding sport. “I competitively twirl, so I get to travel to a lot of places. The hardest part is applying what I learned in practice when it’s time to compete. I always get nervous when I compete, but my coach tells me to just do my best. Sometimes it’s hard to manage time, because we may have long practices, so I like to make sure I have my homework done before I go,” Bowling said. Twirling requires dedication and responsibility. Zahra and Melanie share admiration from marching band members who see and respect their hard work. “Melanie and Zahra are really good,” sophomore Mikayla Rypkema said. This is their second season with us. They come to all of our practices, but since their coaches travel, they have done a lot of the work themselves this year. I think it’s good for them, because it will help them later in life, even with things that don’t have anything to do with twirling.” The sophomore said. Fellow marching band member, junior Hannah Crouch, shares her reaction from the field. “Both of them work very hard. They come to all of our practices, work together to create routines when their coaches are gone. I know I could never be able to go out in front of everyone and do what they do. They didn’t really work with us a lot last year, but they’ve been with us a lot this year and will be performing at the Christmas parade with the marching band,” Crouch said.